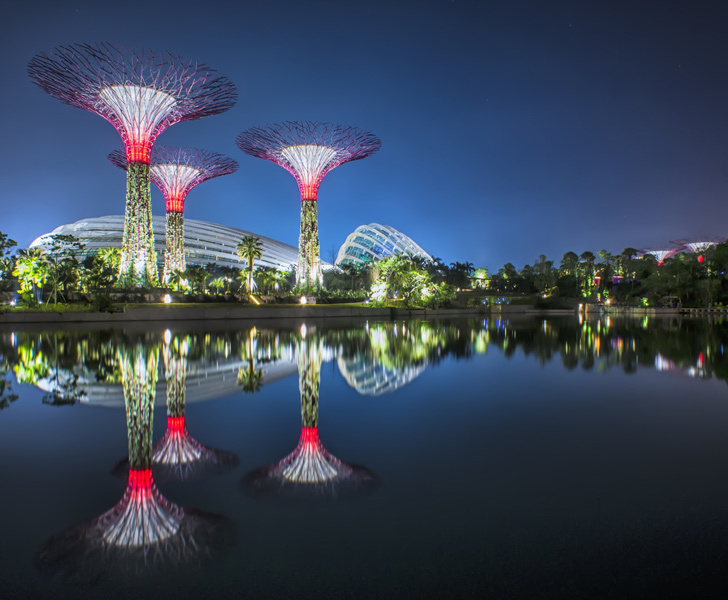 Hot off the press: Singapore's landmark Gardens by the Bay has scooped the coveted World Building of the Year award at the World Architecture Festival! Officially the prize went to Wilkinson Eyre Architects for their design of the Cooled Conservatories, which are thought to be the largest controlled-climate greenhouses on earth. Festival director Paul Finch emphasized at the awards ceremony that landscape architect Grant Associates and engineers Atelier One and Atelier Ten also played a huge role in the development of Bay South Garden's magnificent greenhouses, which are built on reclaimed land. Wilkinson Eyre applied a host of innovative sustainability techniques to the construction of the Flower Dome and Cloud Forest, which are two massive greenhouses that nurture a resplendent array of endangered plants from Mediterranean, Semi-Arid, and Tropical Montaine climates. The fragile gridshell structures are supported by a series of arches and fitted with a special kind of glass that optimizes lighting for the plants while mitigating excess solar gain so that they don’t get too hot. The roof is also covered with sensor-operated retractable sails that automatically provide shade to the plants when the temperature inside the domes gets too high. Using thermal stratification, Wilkinson Eyre ensured that only the occupied zones of the domes have to be cooled., thereby slashing energy consumption. This involved casting chilled water pipes into the floor, which keeps cool air low to the ground, while hot air rises and vents out of the upper part of the domes. 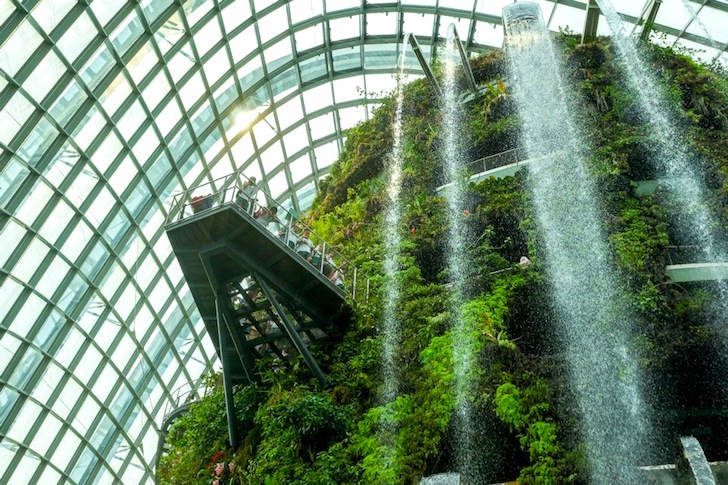 Energy to power the Conservatories is generated on site in part by the solar Supertrees that have garnered so much of the attention, and a Combined Heat Power (CHP) steam turbine that is fed by horticultural waste from the Gardens and other parks around Singapore. Wilkinson Eyre applied a host of innovative sustainability techniques to the construction of the Flower Dome and Cloud Forest, which are two massive greenhouses that nurture a resplendent array of endangered plants from Mediterranean, Semi-Arid, and Tropical Montaine climates. The fragile gridshell structures are supported by a series of arches and fitted with a special kind of glass that optimizes lighting for the plants while mitigating excess solar gain so that they don't get too hot. The roof is also covered with sensor-operated retractable sails that automatically provide shade to the plants when the temperature inside the domes gets too high. Using thermal stratification, Wilkinson Eyre ensured that only the occupied zones of the domes have to be cooled., thereby slashing energy consumption. This involved casting chilled water pipes into the floor, which keeps cool air low to the ground, while hot air rises and vents out of the upper part of the domes. Energy to power the Conservatories is generated on site in part by the solar Supertrees that have garnered so much of the attention, and a Combined Heat Power (CHP) steam turbine that is fed by horticultural waste from the Gardens and other parks around Singapore. The Cloud Forest demonstrates how a warming planet will affect the numerous plant species around the world and features a massive waterfall! The Duke and Duchess of York take a tour of the Cloud Forest!